Our product range includes a wide range of wall mounted racks. Expanda stand also offers Wall Mounted Racks which are the most economic and cost effective solution for small stores. 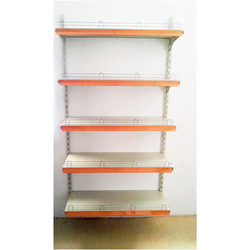 Wall-mounted racks are directly mounted on the wall by drilling each upright/channels to the wall and then placing only the shelves without back panels with the wall as the background, thereby saving cost and also utilising the space effectively for small stores.